"Took my daughter in for warts and Dr. Sands was amazing! He knows his stuff." "Fantastic doctor, he is terrific. He was spot on with everything he did." "Dr. Sands is an outstanding podiatrist whom I have the pleasure of being treated by." "Nice guy. Knows what he is talking about." 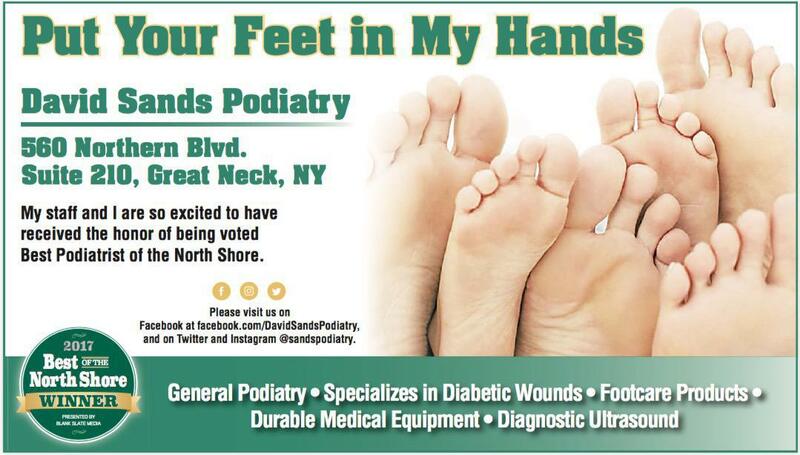 David J. Sands, DPM, PC is a board-certified, award-winning podiatrist who views personalized service and patient education as an integral part of healing. 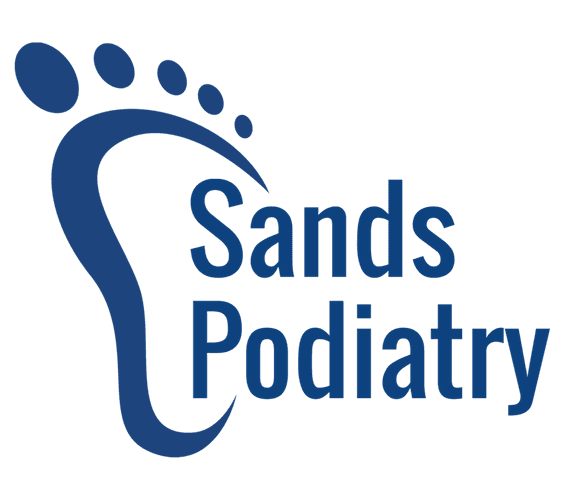 His commitment to helping you understand the origin of your foot and ankle symptoms is why Sands Podiatry in Great Neck, New York feels like an old-school doctor’s office rather than an impersonal factory. It’s also why you won’t find long lines in Dr. Sands’ waiting room or ever feel rushed through your treatments. Dr. Sands earned his DPM from The New York College of Podiatric Medicine in 1996. He completed a residency at the Catholic Medical Centers of Brooklyn and Queens, New York, where he was Chief Resident. He was then hired as the associate residency director, training resident podiatrists. In 2001, he became board-certified in foot surgery by the American Board of Podiatric Surgery. In 2002, Dr. Sands was named Director of Podiatry at St. Mary’s Hospital. Dr. Sands is also extensively trained in wound healing. He received his training at the Wound Healing Center at St. Joseph's Hospital in Flushing, NY. Dr. Sands is trained in advanced wound-healing modalities and with the use of the newest techniques and wound care products. Dr. Sands utilizes bio-engineered skin grafting among other methods to accelerate wound healing. He is also trained in advanced surgical techniques to address chronic wounds and limb-threatening infections. Although he’s been in private practice since graduating from his residency, Dr. Sands has also worked at a variety of local hospitals as a diabetic foot-care and wound-healing specialist. Currently, he spends each Monday afternoon practicing at a state-of-the-art wound-care facility at St. Joseph’s Hospital Wound Care and Hyperbaric Oxygen Center in Bethpage, New York. Dr. Sands is so committed to helping you understand how to optimize your foot health that he includes iPads in every consultation room. You can use the iPad to learn more about your foot pain, what caused it, and why Dr. Sands chooses minimally invasive therapies to resolve it whenever possible. At SandsPodiatry, Dr. Sands also provides on-site ultrasound to diagnose your foot or ankle pain quickly, easily, and accurately. His facility includes high-tech treatment options, such as pain-free radiofrequency ablation for heel pain and neuroma pain, MicroVas to reduce pain and improve function, and the CoolBreeze laser to treat onychomycosis and other conditions such as plantar’s warts. Dr. Sands thanks you for putting your feet in his hands. He is honored to have been named the Best Podiatrist of the North Shore in 2017. 1. Have you fallen in the past? 2. Do you have arthritis in your feet or ankles? 3. Do your legs or ankles feel weak or unsteady? 4. Do you drape your feet, stumble or shuffle when walking? 5. Do you find it necessary to grasp stationary objects, walls, furniture, rails, to gain balance when walking? If you answered yes to any of the above questions you may have a balance problem that could be improved with the use of a Balance Brace. Heel pain is one of the most common orthopedic conditions that we treat in the office. Heel pain can be caused by a number of reasons including inflammation of the plantar fascia (plantar fasciitis), inflammation of the heel pad, ligament and tendon tear, stress fracture and nerve entrapment. We utilize diagnostic sonography in addition to conventional radiography as tools to assess and diagnose where your heel pain is coming from. We use a stepwise approach to the treatment of heel pain, starting from the least invasive treatments first. 1. Do you have a sore on your foot that just doesn't want to heal? 2. Are you a diabetic with poor sensation, tingling or pins and needles on your feet? 3. Are you a smoker with cold feet? 4. Have you ever had an amputation of a toe or part of your foot? If you answered yes to any of the above questions, you may be at risk of developing an ulcer on your feet. David J. Sands accepts most major insurance plans. Here is a short-list of some of the most popular plans we accept. Please contact our office if you do not see your insurance provider listed. "My original consultation and x-rays were done fast and efficient. Everything was explained well. Dr. Sands has a great personality and makes you feel very comfortable." "Dr. Sands is the best podiatrist my wife and I have ever seen. He is considerate, patient, takes all the time you need and is very knowledgeable." "Dr. Sands is an excellent doctor and I could not be happier. Caring, thoughtful, thorough, and doesn't do anything that is not necessary."